Our State rooms were opposite each other and very comfortable. We sat first table all the way across the Atlantic. Had roast mutton and vegetables first day for dinner. The food was good. Passed three steamers that first day. Got up at 5 am and took Mamma for a promenade up and down the deck before breakfast then Mamma went to lie down, it was quite breezy. (Breakfast hour was 7 am.) Arthur was sitting at Mamma’s feet while she lay down and I was sitting at her head and we were talking with Mrs Black, a passenger. Dinner at 12 noon, Arthur missed his and lay down most of the day. Mamma rested after dinner by lying down on her bed. I had a short nap then Mamma and I ate apple together and then went on deck for a walk. Soon after I felt sick and missed my supper. Monday morning went to table took a sip of coffee and no more for the day and sick all night. Mamma has kept up, rather the better of us three. I felt a little better, had a light breakfast and dinner. I sat in Ladies Cabin most of the morning with Mamma. Arthur is well after two days of sickness. I missed my five o’clock meal but had much at 8.30 pm. And soon retired for the night but the Lucania rocked so we scarcely sleep. Got up 6 o’clock had a light breakfast and spent most of the morning in Ladies Cabin with Mamma. Arthur was moving around the Ship. The sea was a little rough with showers of rain and sunshine. At 11 am we sighted a ship. Our noon meal was soup and roast mutton and vegetables and fruits after which we promenaded the deck. 2.10 pm the ship still rocks and the waves came on the Steerage Deck and some passengers got wet feet. A spray came over the ship this afternoon and lots of men and ladies got a good sprinkling. We were not in it but the ladies’ hats and feathers. I was visiting in our State Room. 6 pm Saw the masts of a ship about 40 miles to the north east and at 6.30 saw a short rainbow to the south. I took three meals for the first time. Mamma has not missed a thing. 7.15 pm passed a steam ship heading for New York At 7.35 saw a sailing vessel going towards N York. Up at 5.30 am and took Mamma for a walk on deck before breakfast and after Mrs Black. We just passed one steamer and three sailing vessels. 9 am Now going to write my daughter at Pendleton, Oregon and to George my son at Portland, Oregon. Thursday evening many of us joined in singing Gospel songs while Dr Fry, a Scotch man plays on the piano. Saw the first land. 10 am Arrived at Queenstown. 3pm left off passengers and mail and left 4pm. We got up at 4.30 am had breakfast 5.30 and arrived at Liverpool 7 o’clock am. We saw Captain John Prideaux waiting on the wharf to receive us. 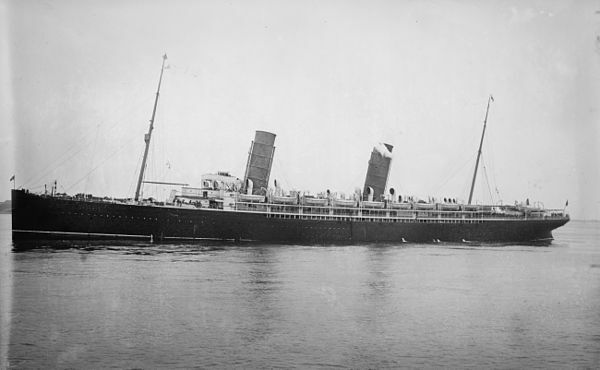 At 8.30 we went ashore and quickly passed the Custom Officer by the assistance of Capt. Prideaux and about 9.30 arrived at Capt. Prideaux’s home and received a kind reception from Mrs Prideaux and her daughter Lillie. We were soon refreshed with a cup of tea after which Capt. Prideaux took Arthur and I to see Stanley Park. It was one of beauty in which was the Gladstone Conservatory of flowers, palms and plants and were beautiful to behold. (It was heated with hot water.) The walks, the bridges, the ponds, the swans, the birds and scenery was simply grand. We turned homeward at noon.